I am finally sharing this look from months ago. I was so excited when this jumpsuit arrived. I styled it right away and for some reason didn't share till now. 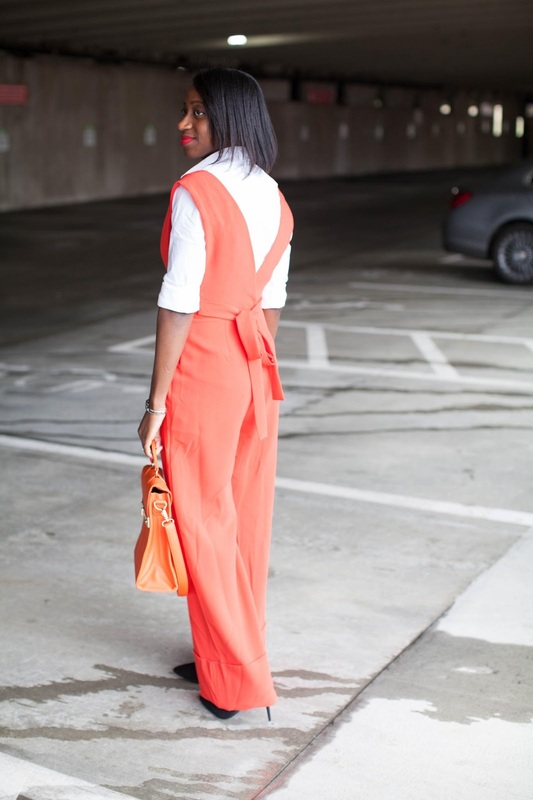 It is easy to see why I love this jumpsuit so much. I only wish I got it in black as well because I believe it is one of those pieces you can own and wear for a long time and still has the wow factor every time you pull it out. 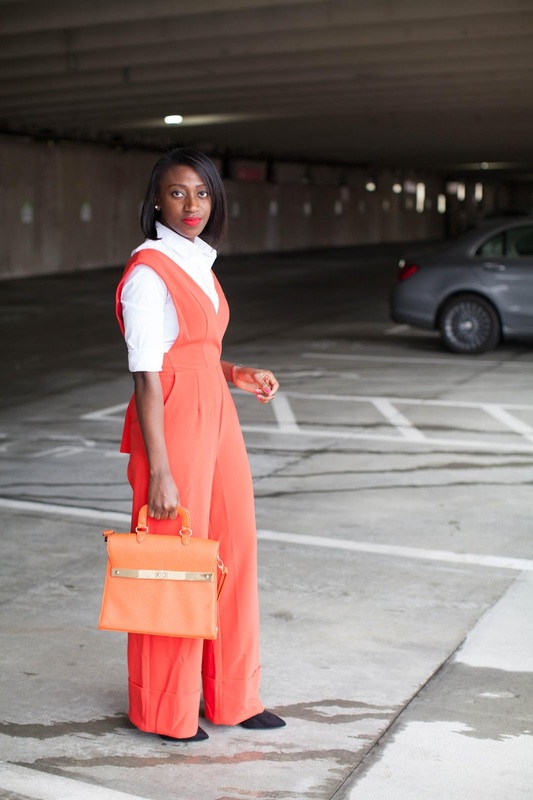 The deep V neck line cut, the wide leg, the pockets! Although, I could do without the belt in the back, it works. The belt was front tied as modeled but I decided to tie mine at the back. Given I naturally tend to shy away from clothing that are too revealing, I am glad I saw the potential in this one and made the move. Granted I most likely will never wear it by itself, the possibilities are endless as far as layering. The deep V cut lends itself well to pairing it with different styles of blouse or shirt as seen here. And, maybe even layer on top of it. 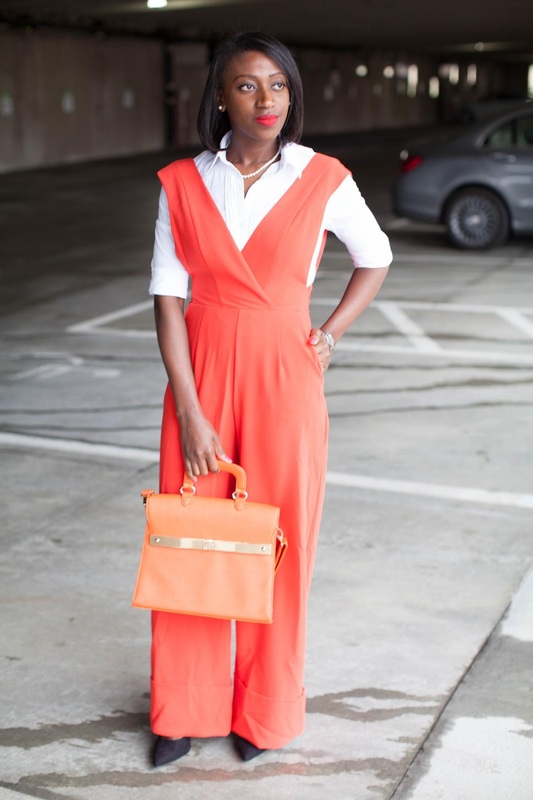 While this particular jumpsuit is sold out, I have rounded up some good options for wide leg jumpsuits that works both on its own or layered up below. Just a note, as you can see, I sometimes, make that most times fall behind on styling/ posting my new finds like this. 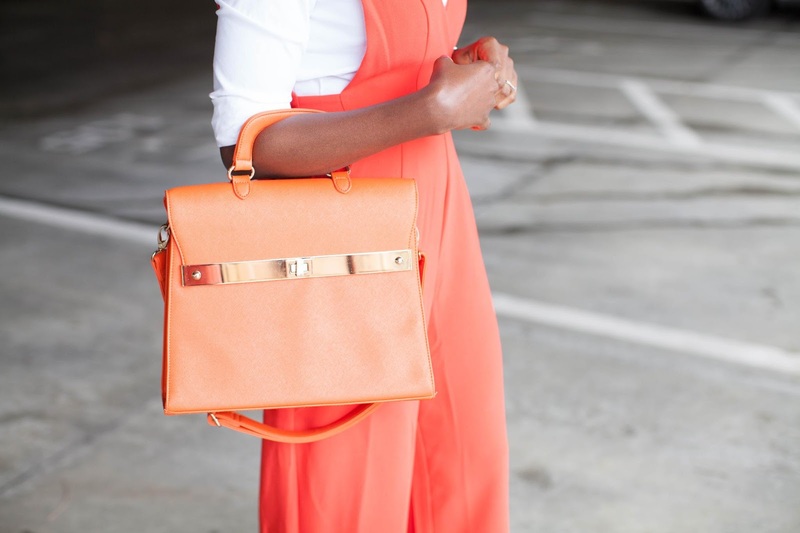 That is why I created the "Shop My Closet" session on the blog (on the main page). I am pretty good at updating it with new additions to my closet. So, feel free to scroll through and see my new additions before they get sold out. Also, there are some looks that I only post on my Instagram that do not make it to the blog. You can see those here with direct link to the exact or similar items. I especially love this page on my blog because it makes it easy to find all my looks in one spot. PS: In other news, I feel like I have to state it on here for some level of accountability and not fall back. I am going natural! I never thought the day will come that I will be able to say this, but here we are. It has always been at the back of my mind but I finally took the plunge and made the decision to do it thanks to my new stylist here in Florida. And, the fact that my hair was badly damaged for a variety of reasons and a bad haircut. No, there will not be a big chop, and yes, I will still wear my hair straight most of the time. at least till I outgrow and cut off all my relaxed hair slowly and see what my natural curls looks like. So, you might notice my hair getting shorter and shorter or it appears it is not growing, that is why. I do the bare minimum with my hair, so we'll see how this goes.